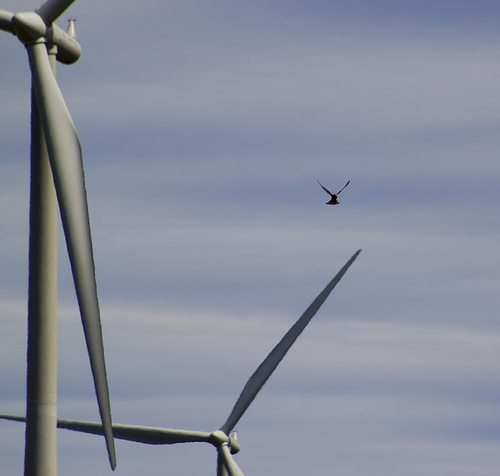 The most widely held concern about wind turbines is the threat to birds and other flying creatures. An obvious problem is collisions. However, recent information indicates that this risk may be exaggerated. A 2011 study found that less than 1% of migrating ducks and geese come close enough to on shore wind farms to be at any risk of collision (Desholm). More probable impacts include avoidance of the areas and habitat loss (Allison). These indirect effects will likely cause more deaths than collisions. Bats are also at risk of injury and death from wind turbines. When hunting for insects, bats can be drawn to wind farms. Barotrauma is caused by bats flying in the low pressure areas just behind moving turbines. This puts stress on the bat’s lungs and they can actually burst. For more information about collisions with wind turbines and other energy generation devices click here.